[By Nick, Only in Scoop Shops] When this review goes live, I will be on my way to Vermont for a very special trip. 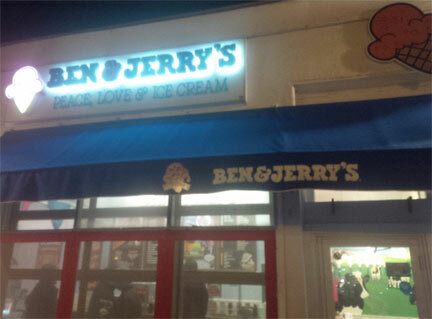 Remember how years ago Dubba was invited for a VIP trip of Ben & Jerry's? Well, now it's my turn! Be sure to follow me on twitter and instagram to keep up with what exactly I'm up to. There will be a more complete post of the tour sometime next week. So before I leave, how about we take a look at the two latest Saturday Night Live batches available at scoop shops, shall we? More quick stories. Remember how I did the #SundaesForShelters last year? Well I was at the Shelters of Saratoga 5th Annual Gala the other day and managed to swing by the Saratoga Springs B&J scoop shop afterwards to try out these two flavors with my date, Mary (you know, the girl who helped me conquer all those flavors at Emack and Bolio's). Two Wild and Crazy Pies on the right (released September 2014). 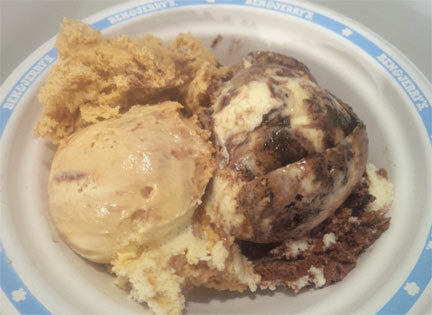 Pro Tip: If you're ordering multiple flavors at Ben & Jerry's, ask for them to put them in a bowl instead of a cup. It makes it so much easier to sample the flavors alone without having them mix too much. Since Two Wild and Crazy Pies was released first, let's start there. The bases here are executed really well. The chocolate cream pie base was perfect for me. This is what their normal chocolate ice cream should be like. It's not overpowering but more of a creamy, milk chocolate. It's one of the better bases I've had from Ben & Jerry's and petition it to replace any flavor containing their standard chocolate. It kind of reminds me of a milkier version of Peanut Butter World's base. The coconut cream pie base has just the right amount of flavor to it. It wasn't artificial or have any of those suntan like qualities to it. It complimented the chocolate cream pie base and almost gave it a mounds like vibe. Lastly is the chocolate cookie swirl which will always be my favorite swirl from Ben & Jerry's. It's just so good. Every flavor it's in works perfectly. It gave the flavor a chocolate cookie crust like feel to it replicating that part of a pie. There's only one downfall that I didn't notice right away. The coconut base has shreds of actual coconut. You all know my feeling on those. Thankfully, the chocolate cookie swirl tend to negate it's presence. If it wasn't for Mary pointing it out (she has the same feelings towards it) I might have not known. This one I wouldn't mind seeing it renamed and sold in grocery stores even with those coconut shreds. Next up is Wayne's Swirled. I'm not going to lie, I was underwhelmed when I first heard about this flavor. I mean, it's just their Vanilla Caramel Fudge flavor with the addition of the new dark caramel base you can find in their Spectacular Speculoos flavor. Nothing really screams creative to me and it's the reason why I have never even tried their Vanilla Caramel Fudge. This flavor might just taste less appealing than its description. This flavor is close to tasteless. It's as if the two bases cancelled each other out completely. I mean, just look at it. The ice cream looks like a uniform caramel color and tastes like skim milk it's that bland. If it wasn't for the caramel and fudge swirls, I would've thought my palate had completely collapsed on me. Thankfully I had Mary with me again because she said the ice cream tasted like nothing before I made my comments. The swirls don't even add much to make this flavor worth a sample. Unlike the original sketch, this one is not a winner. Verdict? Two Wild and Crazy Pies is worth the trip. Skip Wayne's Swirled though. Buy Again? It's pretty obvious what my answer would be.